If I had a dime every time someone asked my opinion about which wine club they should join, I could… join a handful of wine clubs. 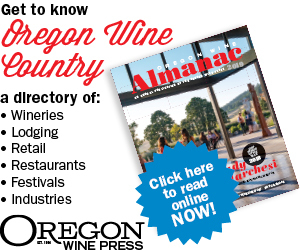 Oregon boasts nearly 800 wineries, translating to hundreds of wine clubs to explore. 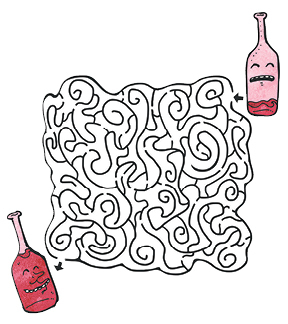 Really, it’s a wine club labyrinth out there. But navigating the “member” maze doesn’t have to entail a puzzling path. Here are some tips to guide you along the way. First, choose which features you find most desirable. Depending on the individual winery, the benefits of membership may vary, but most offer members free tastings, and some even extend that benefit to a couple of your guests — ultimately, they want to convert your friends into members, too. Though devotion and loyalty likely will follow, it’s not really a cult; belonging to the right wine club is more akin to carrying clout. I call it the “How to Win Friends and Influence People” asset. Or maybe it’s more like the “Drink the Wine Kool-Aid” benefit. New and old friends will be drawn to you with magnetic force as they accept your invitations to enjoy great wine and attend members-only parties. Did someone mention parties? With each new club release — monthly, quarterly or bi-annually — many wineries offer seasonal “Pick-Up Parties” exclusively for club members and perhaps a couple friends. In addition to saving you shipping costs, these parties open the opportunity to explore the wines included in your allocation, so you know exactly what you’re stashing in your cellar. When you fall in love with those new releases, you also get dibs before the rest of us, almost a first right of refusal. Since most clubs typically offer members generous discounts — 15 to 30 percent — the savings allow you to feel even better about your purchases. In addition to those pick-up parties, you might find yourself enjoying seasonal harvest and holiday celebrations, summer barbecues, vineyard dinners, seminars and other opportunities. As if you really need an excuse to celebrate wine. Sure, the parties are fabulous, but one of my favorite parts about being a club member is having access to limited-production wines frequently reserved for members only. Some wineries may produce varietal or clonal bottlings in such small production, they make them available only to their club. So, when you bring that bottle to a friend’s for dinner, you can confidently describe your offering as truly special, which leads us back to the part about exclusivity. When you join a club, it’s like becoming a member of the extended winery family. Only in this case, you get to choose your family. And the sense of belonging is worth its weight in wine. As a winery family member, you develop a relationship with the owners and staff. You may be able to access member-only club rooms. You might receive treasured recipes to pair with the wines. And you have the opportunity to take a deeper dive into winery stories and their history. I hear some even gift birthday wine. Consider this: Collaborate with a couple friends, each joining a different club, ones allowing you to bring guests to tastings and events. You can split the wine and share the perks – it’s like getting two memberships for the price of one. And don’t feel like you must stay connected to the same club year after year. Trying different clubs each year will allow you to discover many new wines. Though the benefits of joining a wine club far outweigh the pitfalls, there are a few stipulations to heed before making any decision. Generally, there is no fee to join a wine club and you can quit any time; but remember, you’re making a commitment to purchase a certain amount of wine annually. Read the details of your agreement; your obligations to buy should be stated clearly. I’ve heard some people join clubs on the spot to take advantage of that day’s free tasting and wine club discount. But, if you have the intention of cancelling the moment you return home, don’t. Know what you’re signing up for and honor that agreement. Most contracts are for a year, and, in all likelihood, if you give it a chance, you’ll probably come to realize how much you value the membership. Also consider your available space. Plan where you’ll store your wine. As if having a plentiful supply of wine on hand could ever be a downfall, when you have multiple shipments of wine arriving throughout the year, it’s easy to run out of room — a good but real problem to have. You can always rent a wine locker. Membership agreements mean you may be relinquishing some control over choice. While club tiers may offer red wine only, white wine only or Pinot Noir only, the winery ultimately calls the shots, making the decision about what which ones to include in your shipment. I like to think of it as opening a Christmas gift; it’s so much more fun when it’s a surprise. Last, you might think outside the winery box and consider a local independent wine club (like Cellar 503, which sources all Oregon wine). This type of membership will expose you to different brands, different locations and different types of wine; most of which will be off your radar. As harvest season gears up, many wine clubs prepare to send out their fall shipments; now is the ideal time to join.